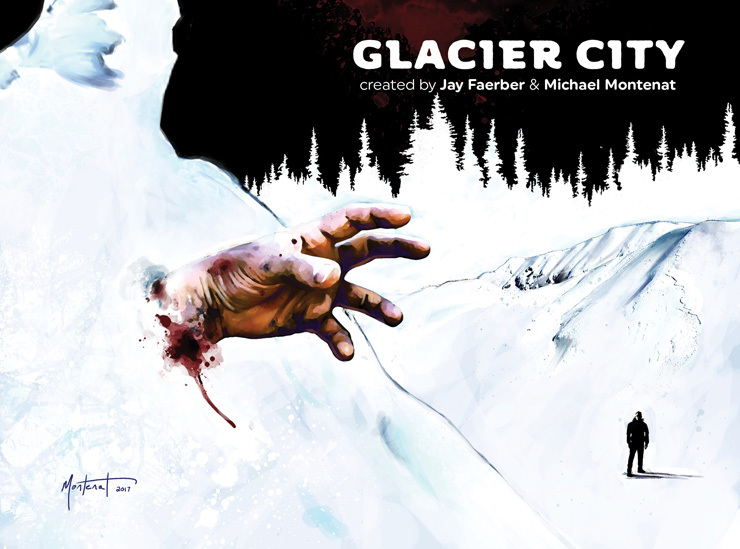 PanelSyndicate online publishing company recently released its launch issue of Glacier City, a police mystery series by writer Jay Faerber (Copperhead, Elsewhere, Dynamo 5) and artist Michael Montenat. The story follows police Chief Wes Cutter as the only law enforcement in a secluded Alaskan town where everyone has a secret and his closest backup is hours away. There are two kinds of people who live in Alaska. Those born there, and those that are running away from something. And Wes wasn’t born there. The new series is an initial digital exclusive to panelsyndicate.com, with a pay what you want service for a downloadable copy. The first issue is a pilot run, which Jay & Michael promise more if the response there is good. If you like what you see below, click over to panelsyndicate.com and get the full “pilot” issue. Special thanks to PanelSyndicate for providing access to the preview pages. You may follow them for more info and other great books on their official site panelsyndicate.com.